The title screen presents you with several options including difficulty, level, option, and demo mode. Difficulty (Beginner, Intermediate, or Advanced), affects the number of lives you start out with and the overall difficulty of the game. Option lets you select Auto fire mode or Manual fire (Auto fire is recommended). Demo puts the game into a short demonstration mode, which shows the basics of how the game is played. And Difficulty is the wave number you want to start out on (1-16). 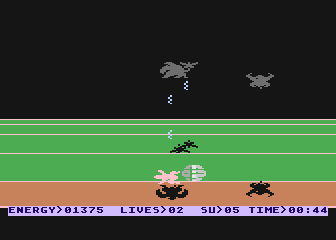 As you start the game you'll notice a status bar at the bottom of the screen. This status bar at the bottom of the screen displays the amount of energy you have left, the number of lives remaining, the number of Shield Units (SU) you currently have, and the amount of time you've been playing. 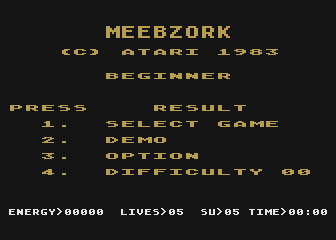 You are the Meebzork. A yellowish creature whose mission is to prevent the flying Gorgons from eroding away the life of your planet with their deadly poison. However this isn't just any planet, it's divided up into 64 rotating bands which contain the planet's life essence. Each band starts out a lush green color, but every time a Gorgons poison shot hits the planet the band will change color from green to brown to blue to red and finally to black. Each color represents the health of the planet, which worsens as it absorbs more Gorgon poison. To heal the planet, Meebzork can use one of his (its?) shield units to return a band to a healthier state. However when a band changes to black that band is considered dead and cannot be healed. 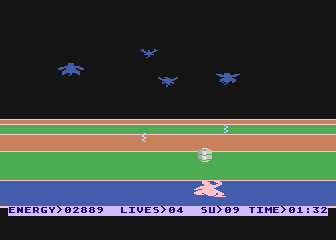 To make matters worse, Meebzork can fall into the holes created by black bands and must use his flying ability to escape. However Meebzork isn't defenseless. Meebzork is capable of shooting energy pulses which can actually absorb the life energy of the Gorgons (killing them in the process). This energy can be use to power Meebzork's flying ability which allows him to move quickly around the planet and escape black holes. The flying power is also useful for getting out of the way of the "The Ball"(tm). The Ball hangs out in the background slowly pacing back forth, just waiting for the right time to strike. When The Ball is ready to strike you will hear a brief warning sound, this is your chance to get the hell out of the way. 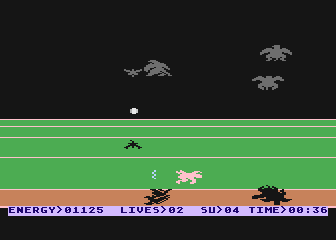 The Ball will then burst forward from the background and fly at Meebzork, and if it hits him he'll loose a life. The problem is there's a glitch in this prototype which causes The Ball to take away one life for every second it touches you instead of just one life period. This tends to make games very short unless you're quick (and get the hell out of the way). Each wave contains 20 Gorgons. 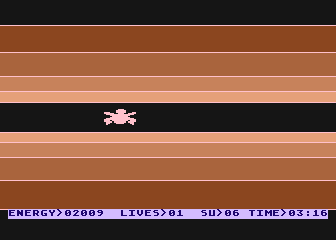 Once you've destroyed all 20, the wave ends and Meebzork must face another even deadlier group of Gorgons. 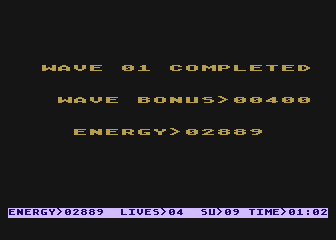 The end of wave bonus is determined by multiplying the number of waves completed times the number of lives remaining times 100. 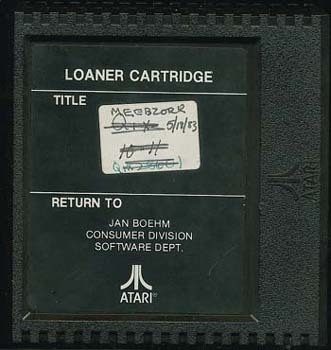 For every three waves Meebzork completes he'll get one new life, and every four waves all the planet's bands are restored to green. Meebzork also gains one shield unit for every five Gorgons he destroys.